The housing industry contributes significantly to annual atmospheric carbon emissions. In an effort to counteract emissions, we strive to achieve positive environmental outcomes by moving forward with new paradigm strategies that employ sustainable practices and products -- and these practices and products simultaneously adhere to standards for energy, comfort, and durability. Mainstream practices emphasize energy conservation measures, which is beneficial, but incomplete. Focus on energy conservation alone is clearly not enough. Further, performance-based mandates disregard sustainable values and fail to prioritize carbon storage in the construction industry. This needs to be reconciled. Primary energy is the total energy a building uses for heating, cooling, domestic hot water, lighting, and appliances. Also, plug loads with energy source factors, such as non-renewable or renewable are taken into account. Together, these energy contributors yield an accurate estimate of how much Primary (source) energy is required and what that environmental impact might be for a given structure. The International Panel on Climate Change indicates that to retain a 66% chance of avoiding a 2C global temperature increase much lower levels of energy use per person will need to be achieved. Fair-share allocations for remaining emissions (approx. 300 Gigatons CO2 equivalent) yield a range of 2.2 to 3.8 tons per person per year for all purposes of housing, transport, food, etc. Understanding this dynamic underscores the importance for sustainable practices in the construction industry. 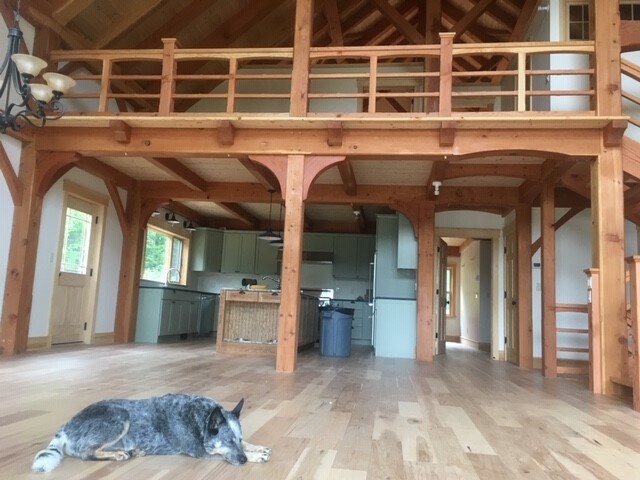 The primary goal is to meet occupant criteria for comfort by maintaining even interior temperatures, reducing heat loss in the winter, and reducing heat gain in the summer. 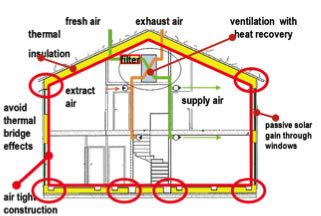 Primary air sealing is a vital component to achieving balanced energy demand and occupant comfort. It is crucial to achieve the exact amount of insulation for the structure -- and once that is attained, the necessary measure is in place to quantify and effectively control interior environments with simple and efficient mechanical equipment. Smart construction practices and design should be employed to reduce thermal bridging as much as possible. Windows and doors reside within this category. Conventional windows adversely contribute to the heating and cooling demands which greatly affects the overall energy balance. Windows should not be as merely a view to the outside world; rather, they should constitute part of the heating and cooling system itself. Properly designed and configured windows within the wall and roof assemblies are central to comfort and performance. Well planned project glazing carefully considers local environments, leverages solar gains, and mitigates heat loss with respect to any given window, door aspect, and/or exposure condition. In our experience, the increased expense for properly designed, quality windows and doors return dividends through reductions of heating and cooling systems’ operational costs -- thus saving money in the long-run. Alternative details in combination with the right materials can be applied simply and cost-effectively, having a substantial impact on the energy performance and durability of any building. 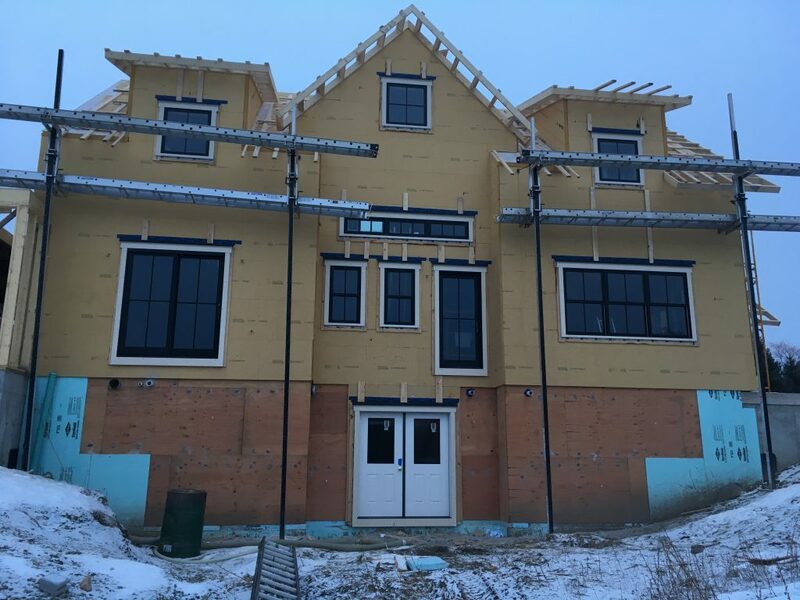 Due to very little heat loss through the insulative assembly, well-insulated buildings result in colder exterior surfaces for the wall and roof in winter climates. The result of this is increased risk of condensation if warm moist interior air is allowed passage due to poor design or execution of simple but critical details. This is especially important when the use of impermeable petroleum-based products reside within in the enclosure assembly. 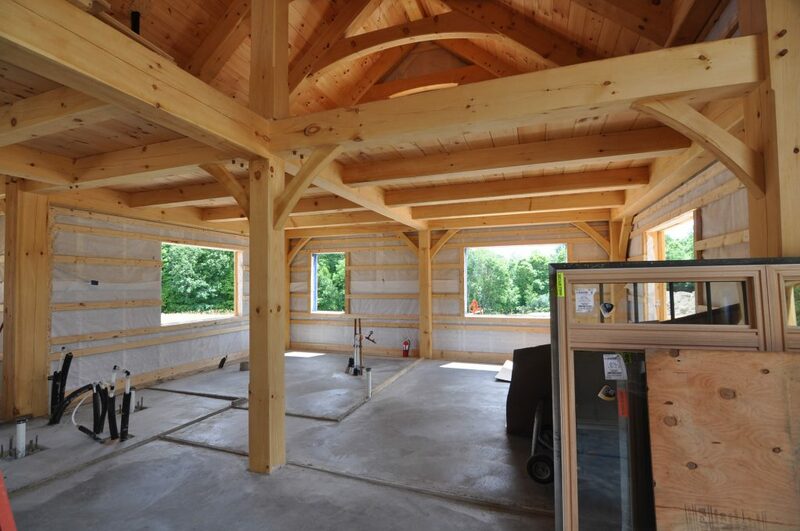 Vapor open assemblies are well suited to plant-based building systems. They deliver exceptional energy performance, with the added benefit of increased durability and resilience. In our experience the cost-to-value ratio is unparalleled with this approach. The vapor open assembly combines the best aspects of high performance standards with exceptionally long service life. This is attributable to the assemblies’ ability to self-regulate moisture levels introduced by both interior and exterior seasonal environments. Increased durability and resilience results in low maintenance costs, increases structure service life, and has a positive environmental impact. 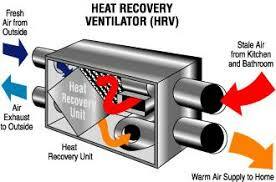 Ventilation is integral to both building and occupant health. Conventional buildings, without balanced ventilation, can create dangerous indoor air quality situations, and this is due to overlooking building science dynamics during the design phase. If poorly executed during construction, or allowed to fall into disrepair through lapse of basic regular maintenance, homeowners risk living with poor air quality. For any given building, a minimum of fresh air supply should be provided for the anticipated number of occupants. Appropriate system sizing is paramount; over or under ventilating should be avoided. Older buildings are typically ventilated by infiltration through leaks in the envelope and poorly sealed windows and doors which provides no opportunity for control of airflow -- and this results in major energy loss. It is not uncommon for newer, conventionally built homes to rely on extractive systems (exhaust fans) in the bathrooms and kitchens. These systems do not offer opportunity for heat recovery, but create a negative pressure within the ventilated volume, sourcing makeup air through envelope leaks referred to as forced infiltration. Infiltration, in turn, adversely impacts indoor air quality as incoming air passes through enclosure material potentially introducing contaminants into the indoor air. A durability concern also exists as incoming air travels through the enclosure assembly introducing contaminates into the indoor air, and potential moisture / mold issues associated with temperature differentials between exterior and conditioned interior air. 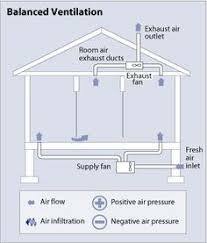 Balanced ventilation systems, however, provide both exhaust and supply air in equal amounts, where air flow rates and distribution can be controlled with the availed opportunity for heat recovery between the two air streams exiting and leaving the building. In addition -- and provided a well-designed, high performance structure -- it is possible to adapt a balanced ventilation supply system to meet conditioning needs via inline heating and/or cooling. This effort of mechanical consolidation is a great benefit towards reducing the size and complexity of heating and cooling systems, ultimately yielding monetary gains through lower initial cost and energy efficiency.